Anyone who has ever had heart surgery owes a debt of gratitude to the late Dr. Michael DeBakey. Today, coronary bypass is considered a routine operation but heart disease wasn’t even treatable back when DeBakey graduated medical school. His work made cardiovascular surgery possible; his inventions and revolutionary procedures continue to save countless lives. A world-renowned surgeon, innovator, educator and medical research advocate, DeBakey performed more than 60,000 operations and published more than 1,000 medical reports in his lifetime. He continued working as a surgeon in Houston until he was almost 90. In 2008, months after receiving the Congressional Gold Medal, he died of natural causes at the age of 99. His boundless energy and grueling schedule had earned him the nickname the Texas Tornado. 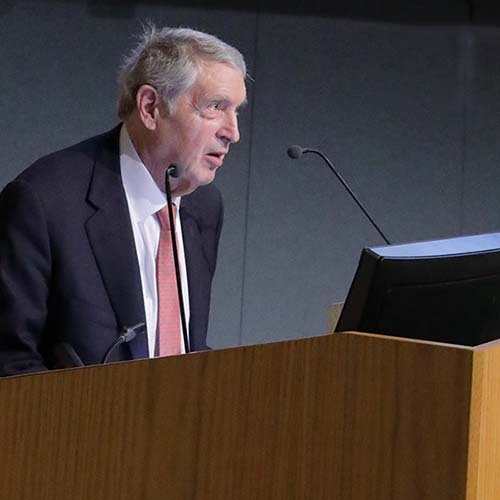 Speaking at the first annual NLM Michael DeBakey Lecture in the History of Medicine on March 21 in Lister Hill Auditorium, McKellar told of the prominent surgeon who garnered great media attention for his medical achievements and for the roster of notables he treated. DeBakey operated on many celebrities, including the Duke of Windsor, Marlene Dietrich and Jerry Lewis. He served as a heart disease authority on many government health initiatives at the invitation of Presidents Kennedy, Johnson and Nixon. He also treated such world leaders as the Shah of Iran and Russian President Boris Yeltsin. DeBakey was featured widely in the press in the 1960s, including colorful spreads in Time and Life magazines. Yet there’s a younger generation that likely has never heard of him. 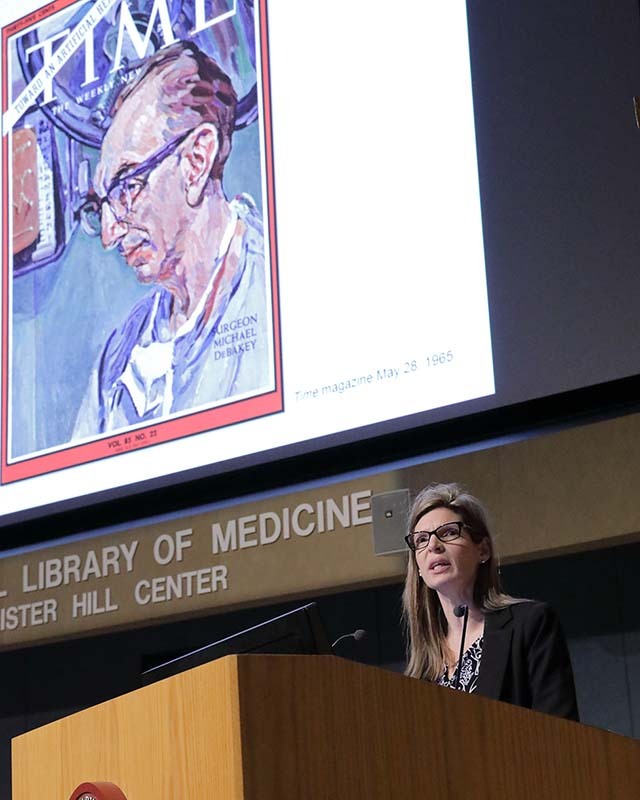 To help carry on his rich legacy, NLM now houses an archival collection of DeBakey’s papers—articles, surgical notes, interviews, correspondence, travel diaries and photos—also available digitally on its Profiles in Science web site. And, thanks to a contribution from the DeBakey Medical Foundation, NLM launched the DeBakey Fellowship program. The inaugural class of five fellows includes a doctoral student, professor and biographer. Often working 18-hour days between the operating room and lab, going on rounds, teaching and mentoring, DeBakey would in a heartbeat rush off to lobby for research funding and was back in his lab before anyone knew he’d left, recalled panelist Dr. George Noon, the Meyer-DeBakey chair in investigative surgery at Baylor College of Medicine, who served on DeBakey’s surgical team. The son of Lebanese immigrants, DeBakey learned sewing from his mother and stitched the first prototypes of his Dacron grafts on his wife’s sewing machine. He performed the first patch graft angioplasty in 1958. These grafts are still used today to repair obstructed arteries. “It wasn’t long before DeBakey’s surgical techniques and prosthetic arteries emerged as the standard approach to treating diseased blood vessels,” said McKellar. DeBakey’s ingenuity was apparent right out of medical school in the 1930s, when he invented a roller pump that became the pulse of heart-lung machines, making open heart surgery possible. In 1964, he performed the first successful coronary bypass and, in the late 1960s, performed some of the first heart transplants. DeBakey developed, and later improved upon, ventricular assist devices (VADs), mechanical pumps that support heart function in people with weakened hearts. He also designed dozens of surgical instruments, from clamps to forceps, still used by surgeons today. DeBakey’s reach extended well beyond the OR. His arrival at Baylor College of Medicine in 1948 to chair its department of surgery began a 50-year affiliation with the medical school. He put Baylor on the map as a leading cardiovascular disease center, where he trained surgeons from around the globe. He also established a high school in Houston for minorities interested in medicine. The DeBakey High School for Health Professions today is a top public school in the city. Tirelessly lobbying for federal research funding, DeBakey convinced Congress to back the National Heart Institute’s artificial heart program in 1964 in response to the problem of heart failure in America. The $1 million annual program budget burgeoned into $8 million within a few years. Through this program, DeBakey and his colleagues received significant NIH funding for mechanical circulatory support system research. Another feat was DeBakey’s efforts in chartering the NLM. “In the process, he made friends and allies with some of the most powerful men in the US government,” said Noon. DeBakey’s love of libraries began as a child in small-town Louisiana, said Noon, where he’d sit outside on hot days reading books he’d checked out from his local library. Later, as a surgical consultant in the surgeon general’s office in the Army during World War II, DeBakey conducted research for the surgeon general. Appalled at the decrepit condition of the Army Medical Library in downtown DC, DeBakey worked with Sens. John F. Kennedy and Lister Hill to establish NLM, which would absorb the Armed Forces Medical Library collection. DeBakey argued to keep the NLM near Washington, as an independent agency operating in conjunction with NIH, said Noon. When President Dwight Eisenhower signed the NLM act into law, DeBakey became a member of, and would later chair, its board of regents. He also helped establish the National Network of Libraries of Medicine, extending NLM’s reach nationwide. This article originally appeared in the NIH Record May 5, 2017. It is reprinted with permission. May 9, 2017 in Events.